Family Friendly Gaming was provided a digital download code for Games for Toddlers on the Wii U. Four codes actually. Three of them were given away on the Twitter and Facebook pages for Family Friendly Gaming. Hopefully you follow those and can experience free games thanks to those social networking connections. Family Friendly Gaming also has a fantastic Youtube channel. There are four games in Games for Toddlers. They are A-mazing, Icy Block Stacker, Happy Cat, and Egg Hunt. Happy Cat is not a game that many toddlers will be able to play. It is like Flappy Bird. This biggest difference is we play it with a cat. The collision detection on that one is questionable to me. The other three games are ones that toddlers could enjoy. There is one issue I have with Egg Hunt. A-mazing is about finding your way through a maze. There are three of them. If you complete all three then you need to quit the game and restart to play mazes again. I tried to go back to it after beating all three mazes and Games for Toddlers would not let me back in. That was very sad. At least I found it sad because I liked that game the best in Games for Toddlers. Icy Block Stacker is all about dropping square blocks on top of one another. The goal is to build a stack as high as you can go. This kind of a mini game has been around for awhile. I loved doing it with cakes in Birthday Bash. Egg Hunt is about grabbing eggs and putting them into a basket in the middle of the screen. Eggs will only go in certain places so the hardest part of that game is finding the right spot. We only have sixty seconds to complete a level in Egg Hunt. Once a level is completed we have to do it again with one more egg. It eventually gets too hard to continue in the time allocated. 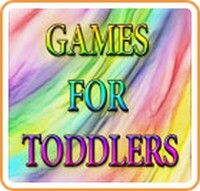 Two of the games in Games for Toddlers are what I would call good games for toddlers. They are A-mazing, and Ice Block Stacker. The other two are less what I would expect for a toddler game. The controls in Games for Toddlers are all touch based on the Wii U Gamepad. I think this is a good concept for toddlers. For me it was not so great though. I was looking for different controls, especially in A-Mazing, and Happy Cat.